Shrimp quesadillas filled with corn, black beans and cheese, and an avocado cilantro lime cream dipping sauce. Quick and easy and everyone loves them! 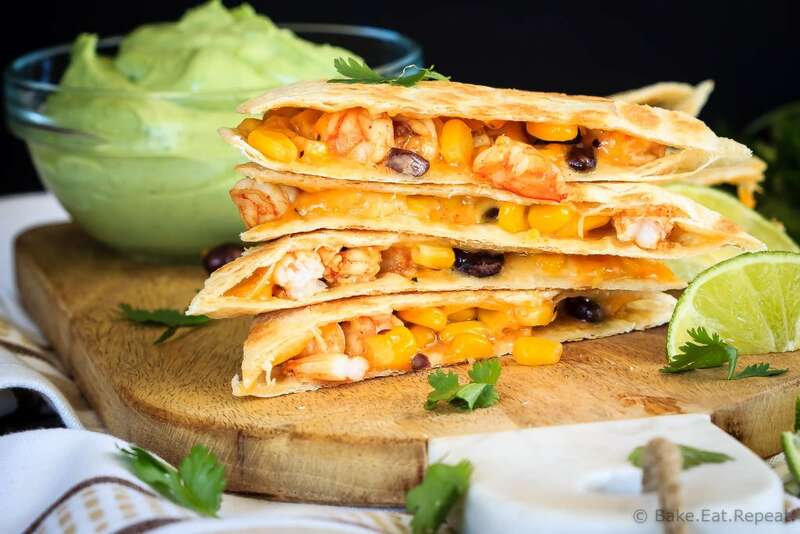 These shrimp quesadillas with corn, black beans, cheese and an avocado cilantro lime cream sauce for dipping are amazing. In fact, one child here was heard to say that they were fancy. I’m not totally sure that that’s true, but hey, I’ll take it. Evidently I’m running a fancy restaurant. He’s probably going to be so disappointed the first time he goes to an actual fancy restaurant and discovers that quesadillas are not, in fact, fancy. I suppose the fact that there was more then just cheese in them is probably what he meant. 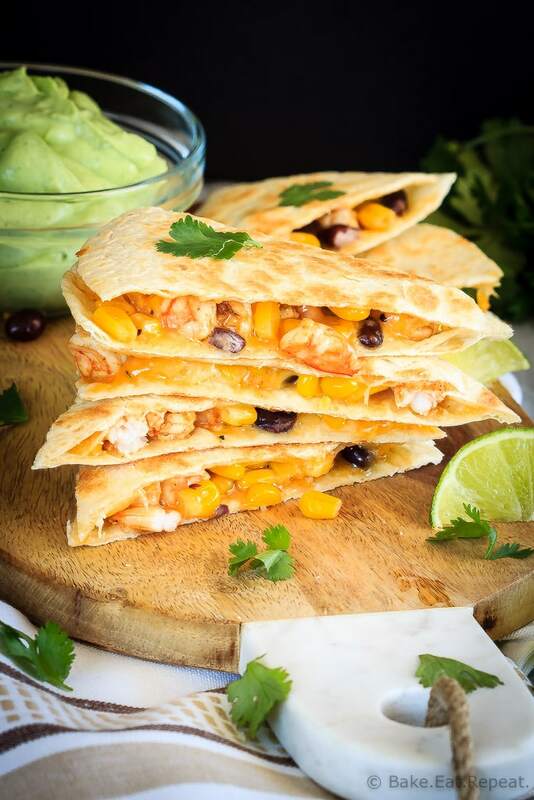 Plain old cheese quesadillas are already a hit with my kids for lunch – so having them filled with shrimp and corn and black beans instead of just cheese was quite exciting. I’m sort of with him on that one actually. Shrimp quesadillas are pretty fantastic. Especially with this avocado cream sauce to dip them in. So this made the perfect meal to share with you for 30 Minute Thursday this month. If you’re new around here, 30 Minute Thursday is the first Thursday of every month, where myself and some of my blogging friends all share a dinner recipe with you that can be made in 30 minutes or less. I love these as I’m always on the lookout for quick and easy meals that the whole family will love. So scroll down to below the recipe to find a whole list of other 30 minute meals! These shrimp quesadillas with avocado cream sauce were perfect. And now you know what to make if you were wanting a “fancy” meal tonight! Prepare the avocado cilantro cream. In a food processor or with an immersion blender, combine the garlic, yogurt, avocado, cilantro, lime zest and juice, and mix until well blended. Cover and refrigerate until ready to eat. In a medium bowl, whisk together the olive oil, lime zest and juice, garlic, chili powder, cumin, salt and pepper. Add the shrimp and jalapeno pepper and toss to combine. Heat a large non stick skillet over medium heat. Add the shrimp mixture and stir fry until the shrimp is completely pink and cooked through. If there is a lot of liquid in the pan at this point, drain the liquid and return the pan to the heat. Add the corn and black beans and stir to combine with the shrimp. Heat through. Prepare the quesadillas: on half of each tortilla, sprinkle some shredded cheese, then spread a layer of the shrimp filling on top and cover with some more cheese. Fold the other half of the tortilla over top of the filling. Dry fry the quesadillas in a non-stick skillet over medium heat (if using the same skillet, wipe it clean first), flipping them once, until the tortillas are lightly browned and crispy and the cheese is melted. Slice into wedges and serve hot, with the avocado cilantro cream for dipping. Source: Adapted from Seriously Delish . Haha, they do look kinda fancy! We're on the same wavelength with the quesadillas today! 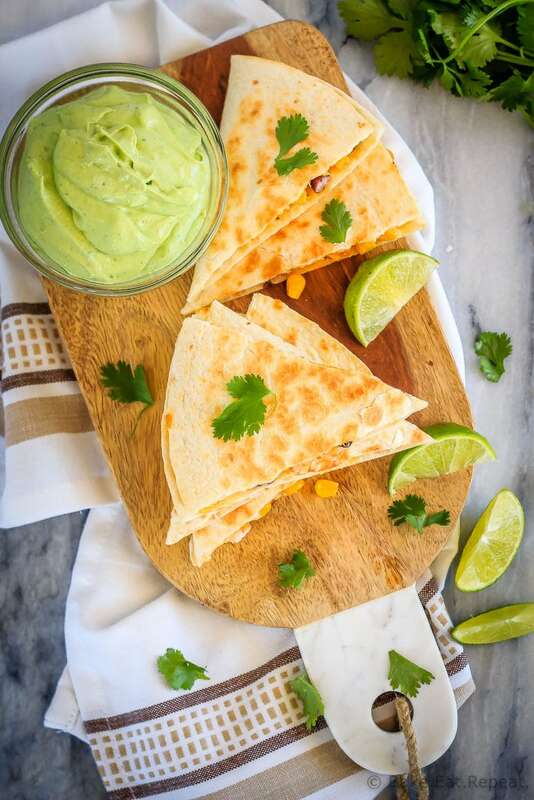 They're such a great quick and easy meal and you can never go wrong with quesadillas! These flavors sound amazing Stacey! We love shrimp so these would definitely be a hit. That avocado cream is a must too -- I love that idea! They look fancy enough for my tastes! Ha ha. I love quesadillas. Nothing better! Quesadillas are one of my favorite places to experiment - but I've never made shrimp quesadillas before. These look fabulous! It's actually the first time I ever tried it, but it won't be the last! So good! Thanks Matea! These quesadillas sound amazing! Love the avocado cream!! Any kind of dip involving avocados is just plain awesome in my opinion! :) Thanks Christina! These quesadillas look delicious! The shrimp and avocado cream sounds like a fantastic combo! I know right? And excuse to eat Mexican food - I'm in! :) Thanks Denise! These sound amazing! And that dipping sauce. WOW! Wish I had some for lunch right now!! PS I adore mexican food too and could eat it every night! I could totally eat it every night, it's so good! Thanks Cyndi! Yum! I absolutely love shrimp and will have to try this quesadilla soon. These trump my lunch of scrambled eggs and toast (pretty much every day...Lol). LOVE quesadillas! Well, they trump my usual lunch of a smoothie and/or yogurt too, so don't worry! But I DID have them for lunch for a few days with the leftovers and they were amazing! :) Thanks Ashley! Oh my goodness!! This looks amazing! I am going to make this soon!! I love quesadillas! Shrimp and avocado cream sounds like a great combination. Quesadillas are one of my favorite foods to whip up during the week. This shrimp version looks fantastic, Stacey! I love the avocado cream, too. Sounds delish! Thanks Gayle! They're such a great, quick and easy weeknight dinner aren't they? !